Home » European » RussianCupid, Want a Russian Wife? 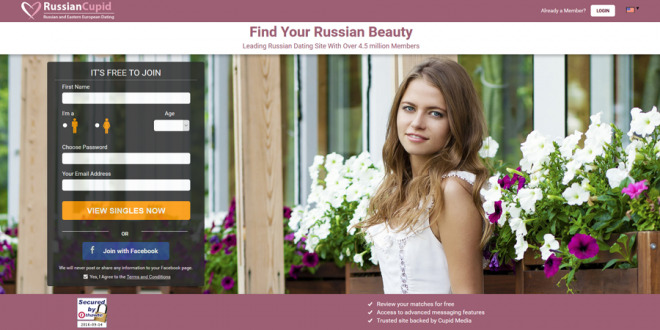 RussianCupid was originally created as an alternative to Russian style marriage agencies. These agencies, many of whom are unregulated, charge men a hefty fee to correspond with women or to buy their contact details. RussianCupid is more like a regular dating site where once you join you can contact anyone you choose and continue chatting to them for as long as you like. You may find a date closer to home than you think as many of the Russian women have already relocated to other countries. Most Russian women are elegant, extremely attractive, and well groomed. If you don’t speak Russian, and most men who use this service don’t, you have two choices. You can either struggle by with the translator system or strike lucky and find a woman who is fluent in English – though they are few and far between and in high demand. The translate tool will quickly translate messages into your preferred language. Though, this is far from ideal. It can be a recipe for misunderstanding and causing offense if not used carefully. The other choice is to put on your profile that you only want to meet a girl who speaks English. This will cut your choices down quite a bit, but it will make the initial flirting and romantic experience much smoother and less like you’re talking to a machine. The way the site’s translate tool works mean you have to be careful to avoid embarrassing misunderstandings. Though RussianCupid is a DIY marriage site, you still have to watch out for scammers. There are plenty about as you will soon discover. The U.S Embassy has some useful advice about avoiding them. Be especially wary of anyone asking for money transfers, gift cards and credits and so on. Also beware of anyone who is keen to get off the official site and onto a private message board – where such activity is much harder to trace. In short, just use some common sense. If someone seems too good to be true, they probably are. Next: InterracialCupid, Thought About A Mixed-Race Relationship? Summary : An active and addictive site for anyone who's interested in meeting someone from Russia to date, to marry or to have a relationship with.